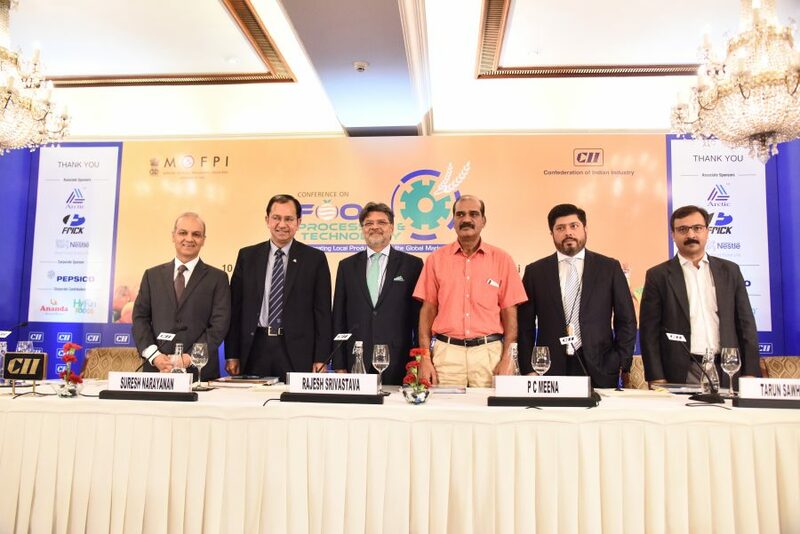 New Delhi: CII in association with the Ministry of Food Processing Industries, Government of India organised a Conference on Food Processing & Technology at Delhi Friday. The theme of the conference was Integrating Local Producers with the Global Markets. The conference was attended by around 120 delegates from the food processing sector including farmers, cold chain experts, food processors, consultants, banks, academia amongst others. In his special address, Mr P C Meena, Agriculture Production Commissioner, Government of Madhya Pradesh invited food processing industries to set up units in the state and emphasized that the State Government is open to suggestions from the stakeholders for improving the State Policy. In response to queries related to waiving GST for new production units in Dairy sector, Mr Meena suggested that as GST is a Central subject, the State Government will approach the GST council with the proposal. In his welcome address, Mr Tarun Sawhney, Chairman, CII Northern Region Agriculture & Food Processing Committee & VC & MD, Triveni Engineering & Industries Ltd mentioned that CII has been working closely with the Central and State Governments for the promotion of Food Processing Industries in the country. Mr Sawhney emphasised that with the increase in demand for nutritious food, rising number of working women and nuclear families, India’s food value chain is poised to create multiple opportunities for investment and employment in storage infrastructure, farming, retail and quality control. Mr Suresh Narayanan, CMD, Nestle India Ltd delivered the key note address and mentioned that the pace with which we are working for the growth of Food Processing Industry, it is poised to enhance value addition, generate employment and contribute to the country’s growth. Mr Narayanan emphasised on the 5E’s that will connect the stakeholders and contribute to the industry’s growth. These E’s are Economic Foundation, Enablement, Excellence in Technical & Product Development, Empowerment to Produce and Environmental Sustainability. Mr Rajesh Srivastava, Conference Chairman & CMD, Rabo Equity Advisors in his theme presentation, suggested ways for integrating local producers with global markets. He suggested that there should be focus on value addition instead of destination markets; encouraging scale, product innovation & marketing focus; capitalize on India’s strategic location between east & west; amongst others. Mr Yogesh Bellani, Co-Chairman, CII Northern Region Agriculture & Food Processing Committee & CEO, FieldFresh Pvt Ltd mentioned that if the surplus production of cereals, fruits, vegetables, milk, fish, meat, poultry, etc. are processed and marketed both inside and outside the country, there will be greater opportunities for adding to the income of farmers and employment.